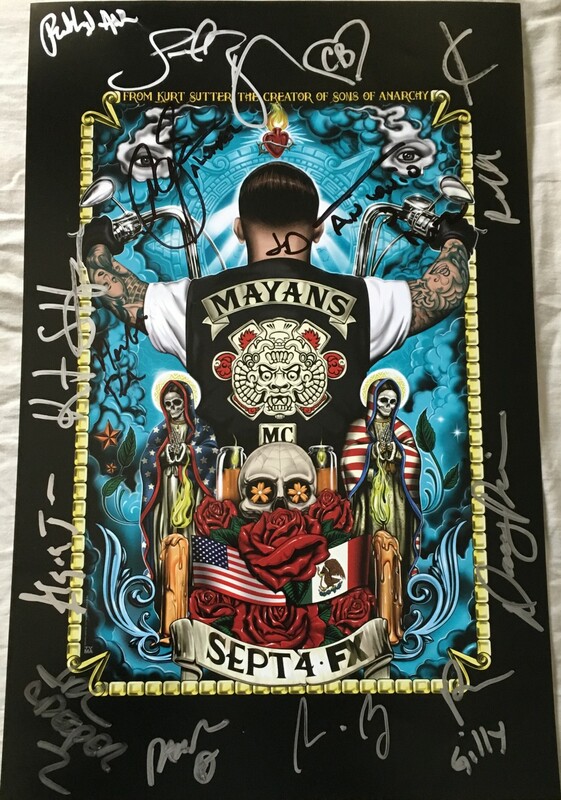 Mayans MC 2018 San Diego Comic-Con 11 by 17 inch poster autographed in black or silver marker by creator/executive producers Kurt Sutter, and Elgin James, executive producer/director Norberto Barba, and nearly the entire main cast including J.D. 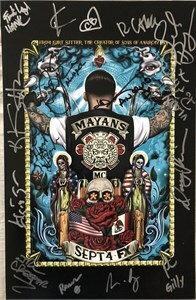 Pardo, Clayton Cardenas, Sarah Bolger, Michael Irby, Carla Baratta, Antonio Jaramillo, Raoul Max Trujillo, Richard Cabral, Danny Pino, Emilio Rivera, Frankie Loyal, Joseph Lucero, and Vincent (Rocco) Vargas. 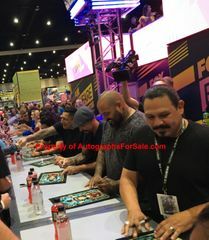 Obtained in person at very limited 2018 Comic-Con signing, with photo from the signing and certificate of authenticity from AutographsForSale.com. HAS MINOR TO MODERATE DINGS, DENTS AND HANDLING FLAWS BUT STILL SUITABLE FOR FRAMING. ONLY ONE LEFT.